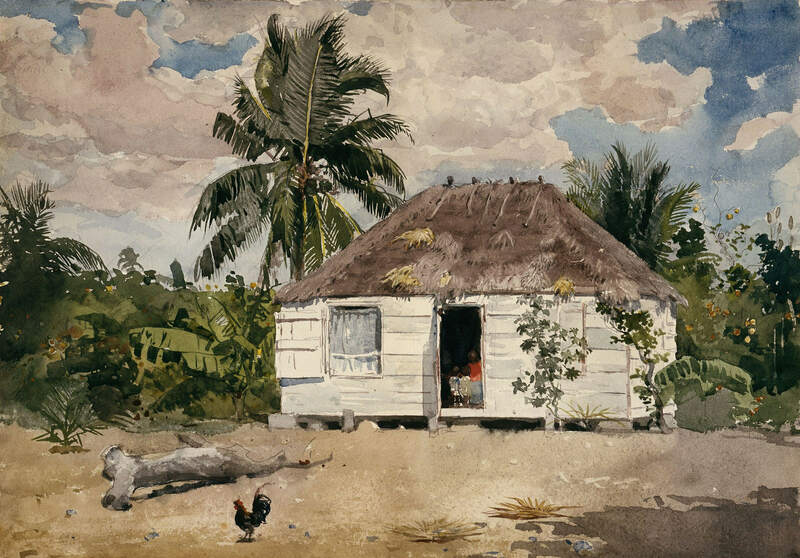 All the stories about Haitian voodoo makes us shiver. It’s so bizarre and at the same time familiar… We saw already very weird stuff, but in this case the more we learn, the more we get scared. 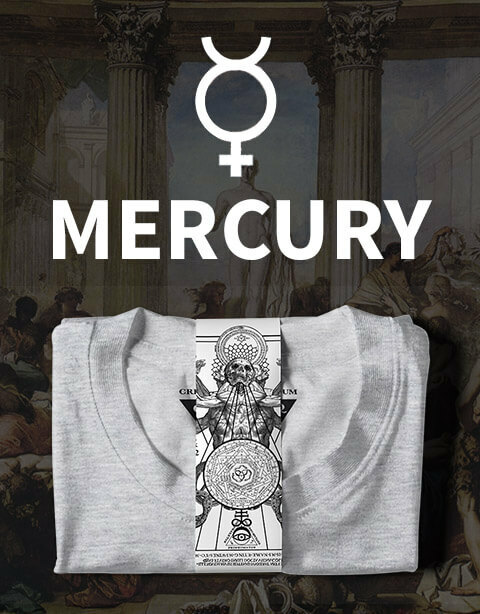 Probably because of its power and obscurity behind the rituals of black magic. Our first experience related to voodoo is linked to the dolls (African voodoo), not the common voodoo dolls we see the pop culture, we mean the wood figures with iron nails spiked around the body- creepy. Vévé for the Voodoo Loa named Baron Samedi. He is considered as a Loa (spirit from Haitian voodoo) of death, of sexuality, and with an absurd sense of humor, some say that he tells dirty jokes and many times (when called) announces his presence saying “Ca ou vlé” – What do you want? 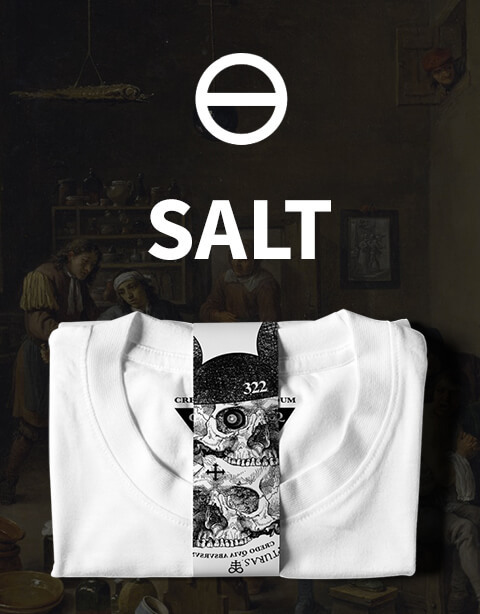 Baron Samedi is also an expression of individuality, and offers you the memory of delighting in the pleasures of life. Living happily and living well, because nobody is spared by Death! The tasks delegated to him are: leading the souls of the dead to the underworld and ensure that all the deceased keep (or not) in the grave, preventing (or not) the corpse to return as a zombie (he has the power to control zombies and bring them back to life). For his favours, what he demands in return depends on his mood, sometimes he simply asks for cigars or rum or black coffee. In a bad mood he can demand a huge voodoo ceremony. 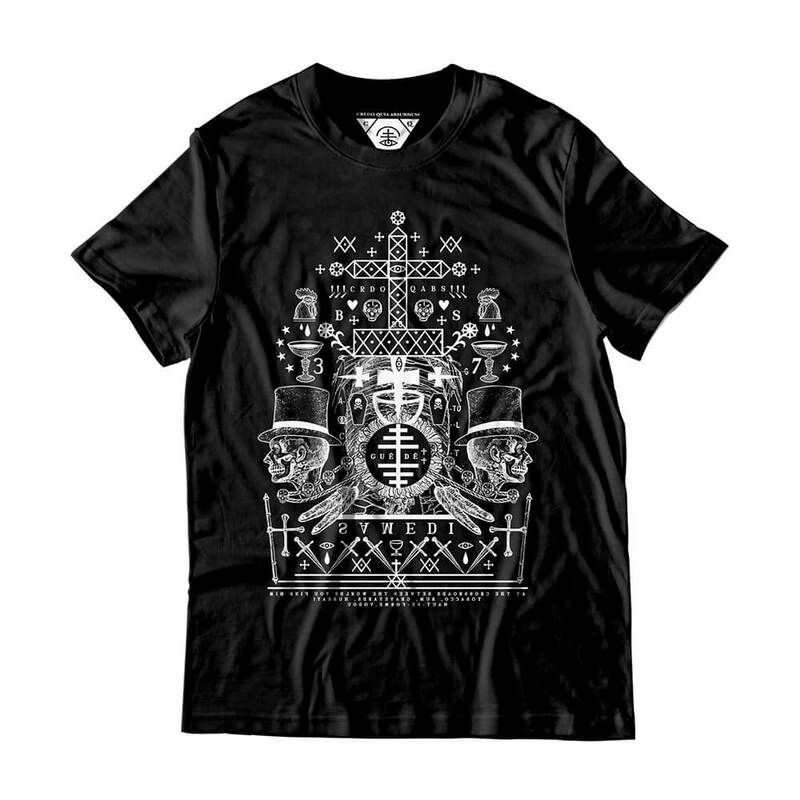 In this design, we tried to include some of the most important/ sacred objects or elements from voodoo, such as skulls and ornaments; daggers; crosses made of bones; coffins; feathers; blood (in a sacred bowl), chicken heads. 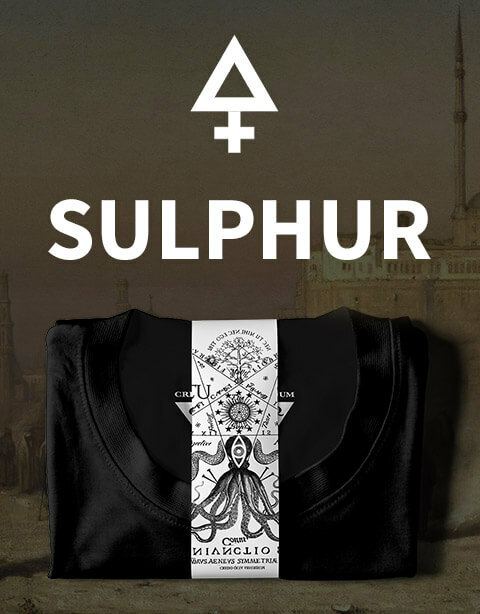 The Baron itself is shown on both sides of the design with top hat and skull necklace. We decide to make him look like a zombie or a human skull. 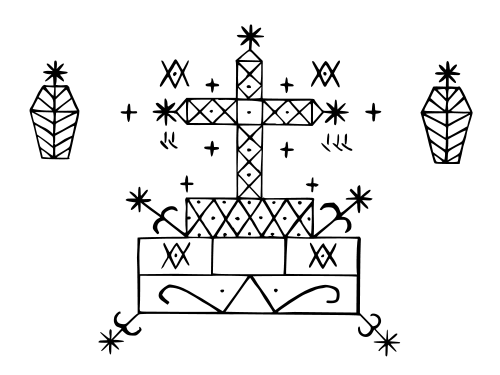 The symbol above (slightly adapted) is the Baron’s Vèvè, a religious symbol (mostly used in Haitian voodoo) used to guide the Loa and will serve as his representative during rituals. 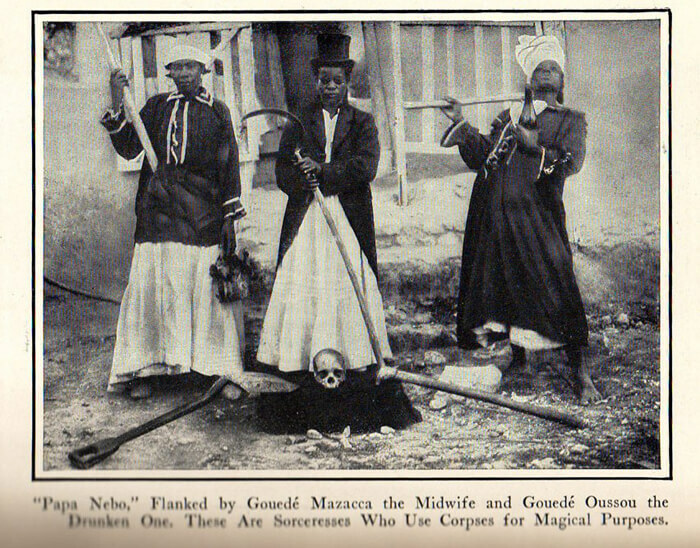 The Guédé (in the center) is the family of spirits who embody the powers of death and fertility, depending on the tradition followed, Baron Samedi could be seen as a Guédé. Papa Guédé/ Ghede is supposed to be the corpse of the first man who died and his physical attributes are very similar to Samedi’s. 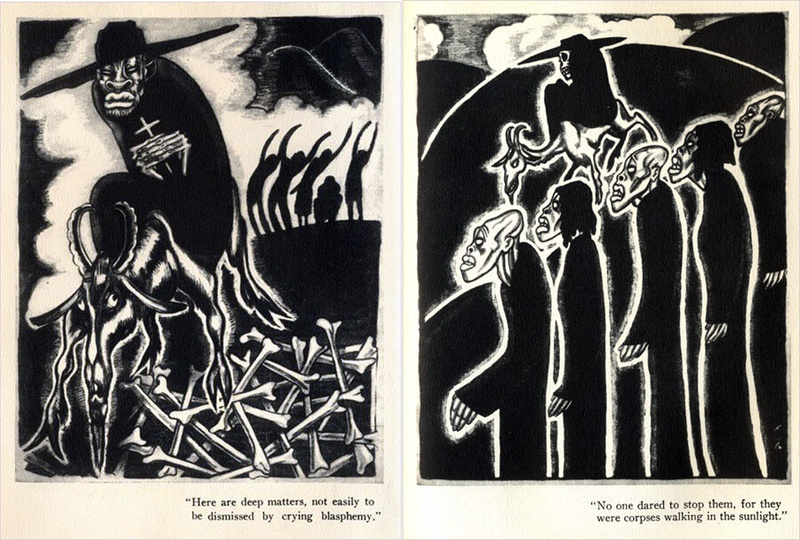 Illustrations by Alexander King depicting rituals to transform dead men into zombies (to work in the cane fields)- from: The Magic Island , William Buehler Seabrook (1929). “the three Guedes” photography from: The Magic Island , William Buehler Seabrook (1929). 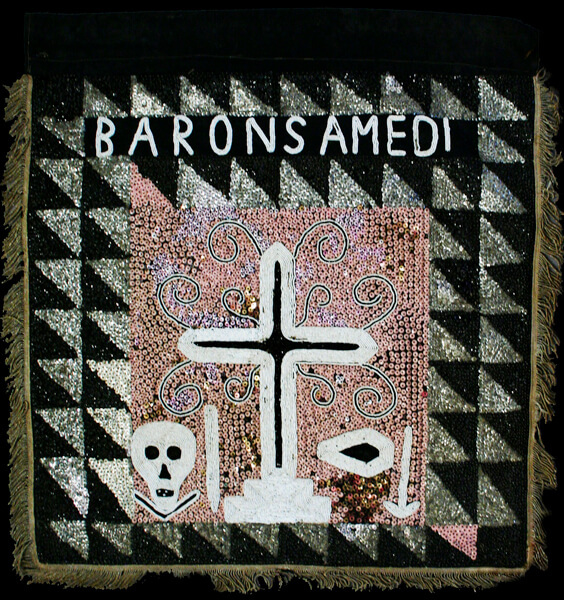 “Baron Samedi banner” (Mid-20th century), Cotton, burlap,sequins, beads, thread, and fringe (Courtesy Thomas Schultz Collection).